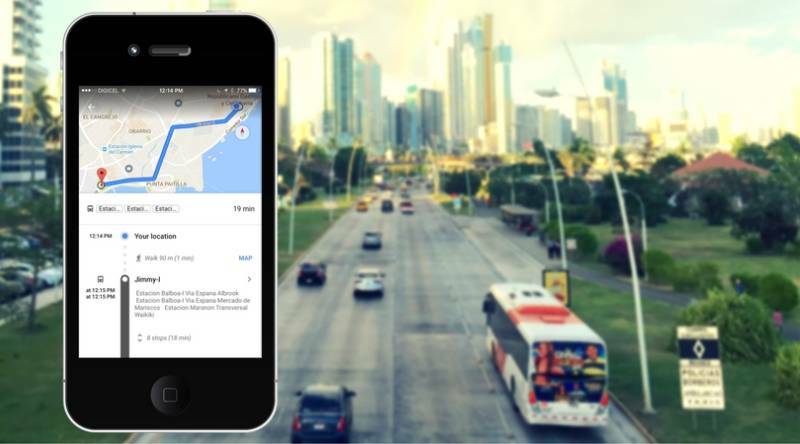 Navigating Panama City’s confusing Metro Bus system is a little easier with the launch of public transportation routes on Google Maps. Learning how to use the bus in Panama City was not an easy task for me and often involved getting lost along the way. The was no “enter start and end destination” and the fastest route would instantly be calculated. I would have to look up multiple routes on a PDF map, hope the bus would actually come, and go where it said it would. On Monday August 23, Google launched a beta version of Metro Bus routes in Panama City on their popular Google Maps app. For the first time in Panama, users will be able to enter their start and end destination and have a step-by-step route on how to get there using the bus and metro. I wanted to see if the public transit directions actually worked so I entered a few destinations into my phone to see if it would display the route and bus that I would normally take. To get from San Francisco to Parque Urraca on Avenida Balboa, I can take the Panama Viejo – Mariscos or Panama Viejo – Albrook busses from anywhere on Via Israel. When I entered the route into Google Maps it gave me the correct stop to go to and get off at BUT the name of the bus that Google says to get on is not accurate to what the bus actually displays. 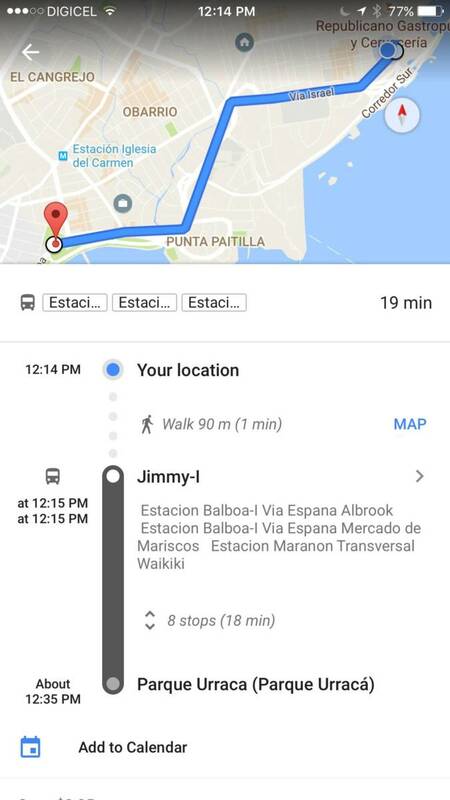 Google says to get on the bus that says Estacion Balboa – Via España – Albrook or Estacion Balboa – Via España – Mercado de Mariscos. A regular bus user can probably figure out the right bus to get on but a new user or tourist trying to do it could spend hours waiting for a bus that is never going to come. The app also gave an alternative route that involved walking onto the Corredor Sur and getting a bus from a toll booth in front of Atlapa. There is NOT a real bus stop here plus it’s telling you to walk onto the highway. The app also gives you the estimated time the bus will be at the stop but this is not updated in real time using GPS so with Panama City’s constant heavy traffic and overall unpredictability of the busses this isn’t something that will be reliable at the moment. Overall the service is a leap in the right direction to modernizing public transportation in Panama City but use the app with caution until the kinks are worked out. Have you given the new public transit directions a try? Leave a comment below on your experience.